PIC-020 is a customised add-on board to allow Digi XBee (ZigBee module) to plug onto a Raspberry Pi module. Power supply to the XBee will be power by Raspberry Pi, and communication will be via Com port 1 (TXD, RXD). The board contains 3x LED to indicate the XBee communication status. Socket for Digi XBee module. 3x LED indicators for XBee operation. XBee is powered by Raspberry Pi. Space saving add-on board with XBee mounted on the reverse side. With some modification, PIC-020 can be enclosed with a standard Raspberry Pi enclosure/casing. 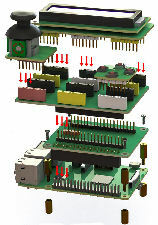 PIC-020 can also be soldered with more components and be used as a general purpose I/O board. Up to 2x relay or optocoupler can be soldered onboard for dry contact operation. It will allow Raspberry Pi to interface with external electrical or electronics devices. We can help you customise an attachment suitable for your application. The device can be compact in size. Power up your Raspberry Pi from a wider input voltage range from 12Vdc to 24Vdc. Contact PIC-CONTROL in Singapore for more information. Click here for more references for your customised Raspberry Pi HAT attachment board.